Knowing that you've got enough stock is important. 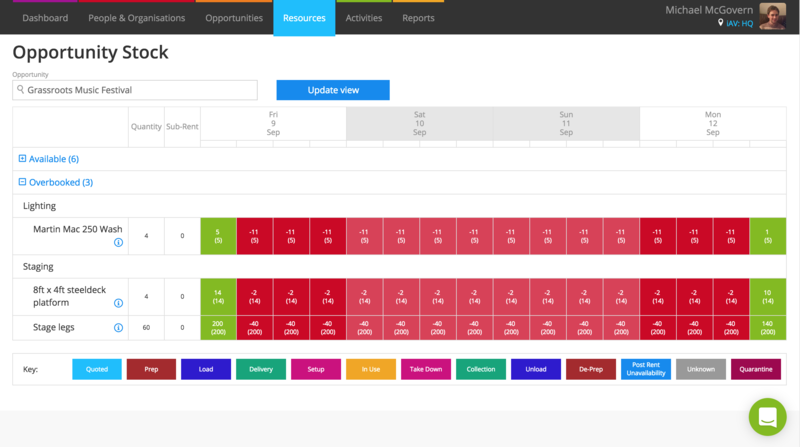 Current lets you keep on top of what's available from your opportunity page with shortage highlighting, the opportunity stock screen, and product bookings screen. Interested in how availability is calculated? See: how is availability calculated? 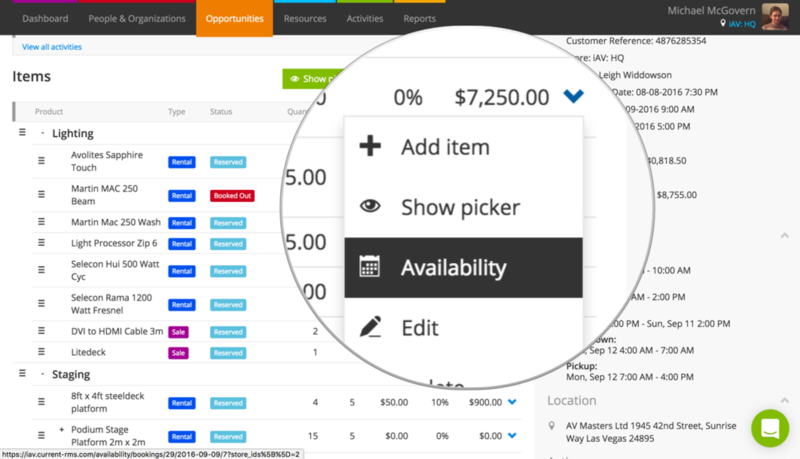 Remember, you see what's available for your opportunity in the picker and Add New Opportunity Item screen. 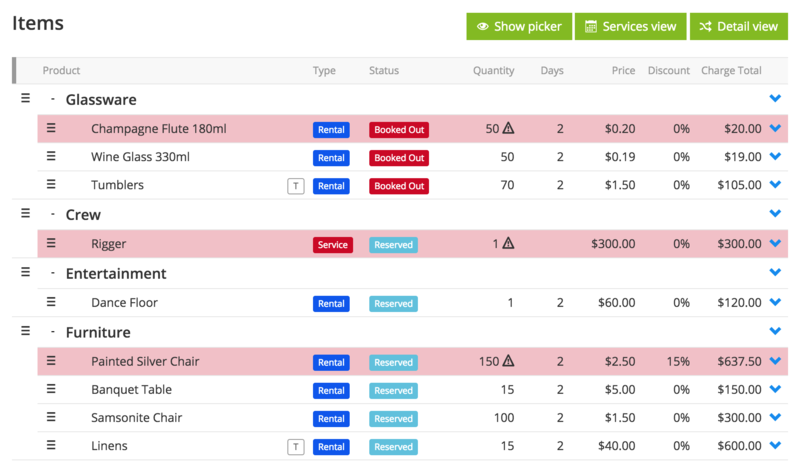 If your opportunity is at order stage or a reserved quotation, Current highlights any products and services with a shortage in red in the items list. For accessories, the plus icon will be highlighted in red. If a product or service has been added to an opportunity more than once, each instance will show as a shortage. Current checks availability automatically in the background. As you resolve shortages, those lines will lose their red highlight. To force a re-check of availability on your opportunity, click Check shortages under Actions. To see what's available for all products on your opportunity, click Availability under Actions on the details pane to bring up the opportunity stock screen. This shows availability for the dates of your opportunity. To view availability for a particular product in the opportunity items list, choose Availability from the blue arrow menu to the right of the item to open the product bookings screen. The most common way to resolve a shortage of rental stock is to sub-rent in additional products. When you sub-rent, you rent additional products from a third-party supplier which you then supply to your customer as normal. Mark items as sub-rented in Current to update your availability. You might also purchase more stock and add or update your stock levels to update availability. Is there a way to swap out items? Can I proceed with an opportunity despite shortages? By default, yes. Sometimes you might turn around an opportunity quickly and not tell the system that items have been returned from another opportunity so it flags up as a shortage. If you know that you've got sufficient stock, Current won't get in your way and prevent you from getting a job booked out. Simply book out as normal. Current will flag that you've got a shortage at each point.